Each shortcut icon on Windows have shortcut arrows by default. I never like these shortcut arrows as they spoils the look of my desktop. If you also don’t like this annoying shortcut arrow on your desktop icons, you can easily remove it using following methods. 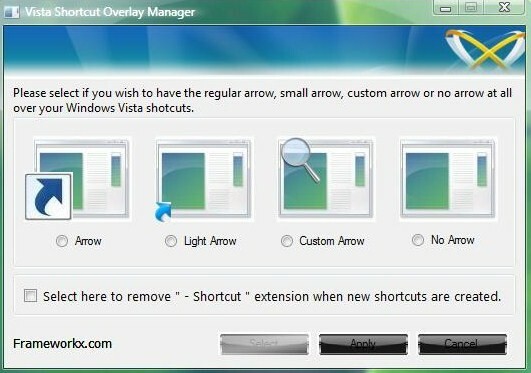 If you are a user of Windows Vista, then you can download a freeware application Vista Shortcut Manager from Frameworkx. Using this application, you can either change the size of your shortcut arrow or you can completely remove it. After selecting your option, log off your system to see the changes. Windows XP users can download Tweak UI for Windows XP. This application will also allow you to change you shortcut arrow to light arrow style. Here is one more method. If you have TuneUp utilities installed on your PC, then you can easily remove shortcut arrows using TuneUp utilities. I always use this method.